With multiple bike-share services to choose from, it can be a pain to open up two or three apps just to see which has the bike closest to you. 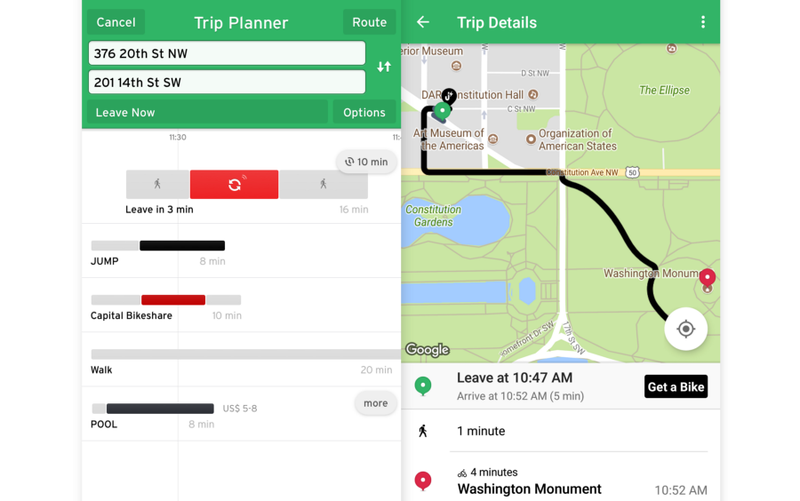 Transit, an app that shows (you guessed it) transit options nearby and recently raised $5 million, now tracks multiple services on its maps of Seattle and Washington, D.C., showing you the best bike to go to regardless of who operates it. It’s a feature I asked about when I chatted with Kyle Rowe, the Department of Transportation official who drafted the permissive rules under which bike-share companies can operate in Seattle. One of the stipulations is that the companies make their bike locations and other data available via a public API. That immediately suggested to me the possibility (nay, inevitability) of a service that grabs data from all three providers here in Seattle (Ofo, LimeBike and Spin) and shows it in a single interface (turns out Baidu Maps already does this in China). Rowe said the city had planned to do just that in early stages but that it ended up being put on the shelf while the pilot program was happening. Ideally, he told me, you’d have one app that brings rail, bus, car-share and bike-share data into one place and lets you plan a whole trip on multiple modes and pay all at once. Until that happens, however, it was left to private industry to do it, and Transit has come through. 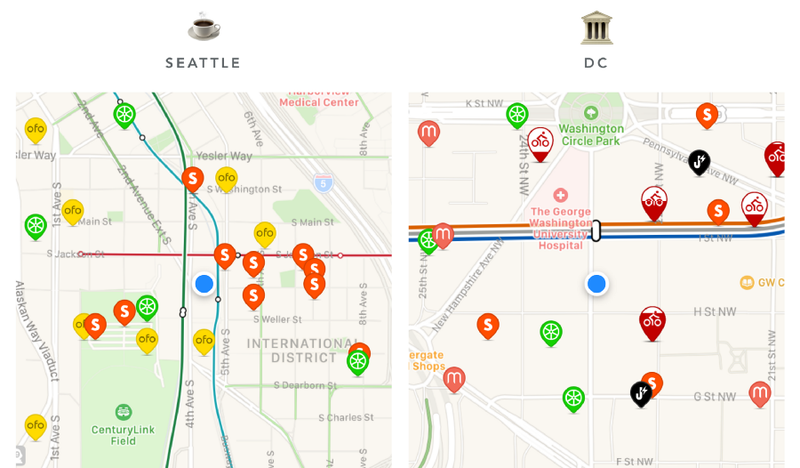 Transit shows the above-mentioned services in Seattle, and JUMP, Mobike, Spin and LimeBike in Washington. It recommends the bike that’s closest to you, but with consideration for your destination if you’ve entered one. So you won’t be walking uphill to get a bike when you’re going downhill and there’s one on the way 100 feet farther away. Locations are updated every minute, so you probably won’t get your bike swooped. The app’s maps also show bike-friendly directions using OpenStreetMaps data on bike lanes and grade, along with some limited data on average congestion or danger to cyclists. Good for tourists who might not know the lay of the land. But they’re still figuring out how to do it right, and like a good company, they’re probably waiting for one of the services to sweeten the deal. The aggregate map will be available in other cities soon, though Sion declined to tell me which or when, so keep an eye out.